The Interstate Renewable Energy Council (IREC) has produced an updated Model Inspection Checklist for Residential Rooftop PV. This 15-page document facilitates a process for local inspectors and installers in plan review and field inspection steps, from structural analysis to signs and labels to be posted. Continue reading here. The Florida power giant has announced that it is the mysterious counterparty that will be supporting JinkoSolar’s foray into U.S. manufacturing, and Jinko has revealed that its Florida factory will have a 400 MW annual capacity. California’s grid operator has chosen to cancel 20 transmission projects and revise 21 others, as energy efficiency and distributed generation prove their worth. 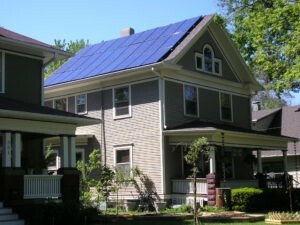 This entry was posted in Installation, Nebraska / Midwest News and tagged policy, PV Magazine USA, reducing the soft costs of solar, residential PV, solar energy costs, SolSmart on April 2, 2018 by Helen Deffenbacher.